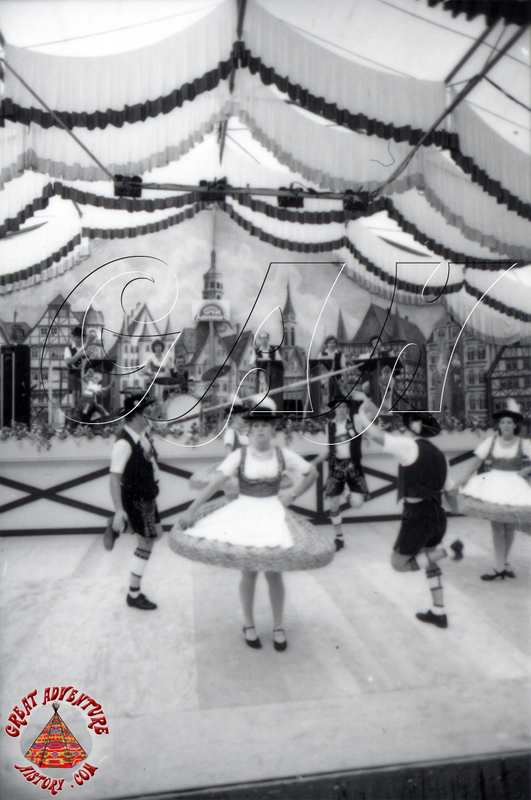 One of the longest running fairs in the world is the Oktoberfest in Munich, a yearly celebration of the harvest season where food, drink and music are everywhere along with the latest and greatest rides from the world's ride manufacturers. 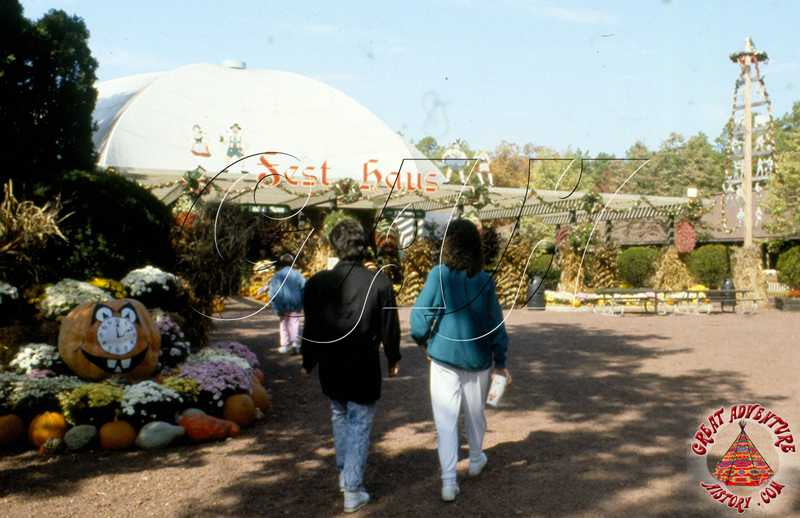 Many amusement parks and theme parks took on the tradition in the United States as a way to boost attendance in the fall. 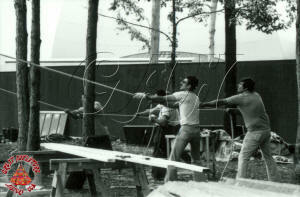 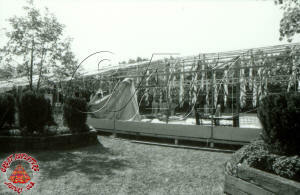 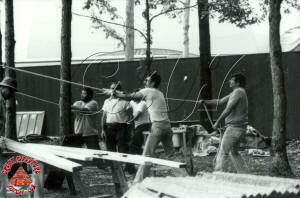 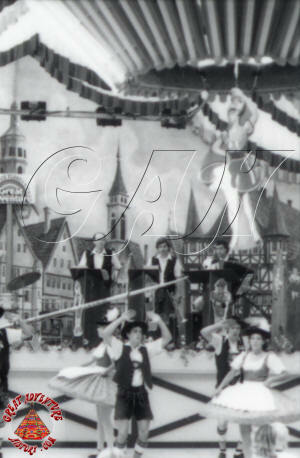 Six Flags Great Adventure in 1980, the park imported an authentic Festhalle from Hanover, Germany. 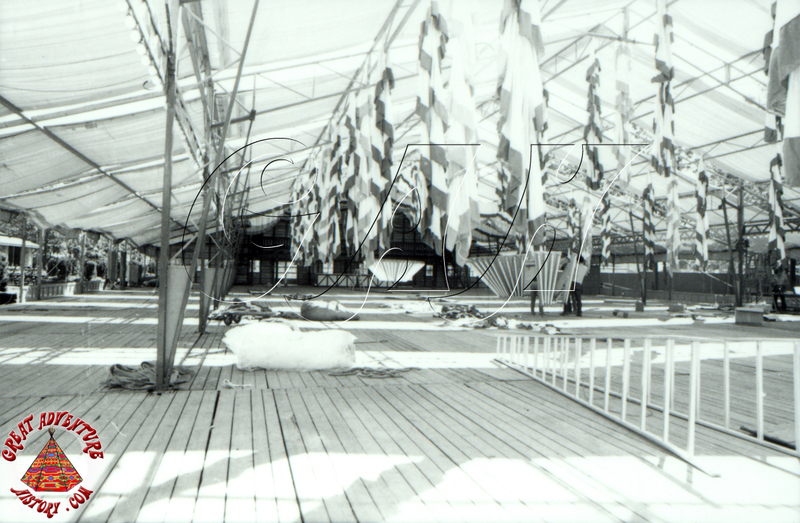 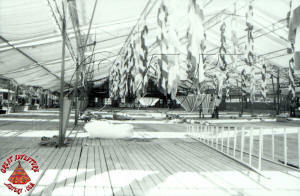 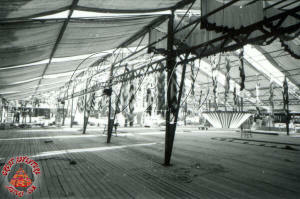 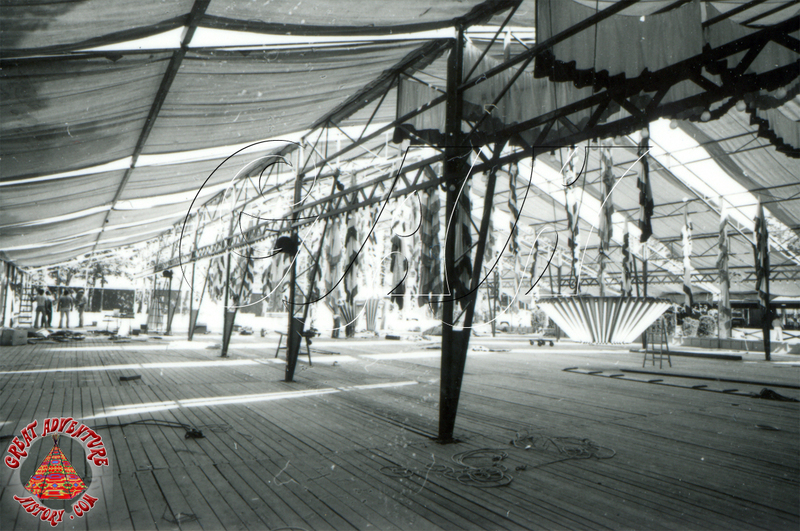 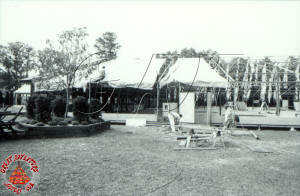 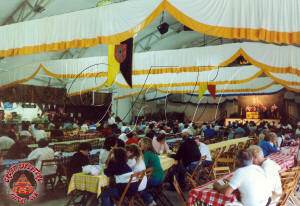 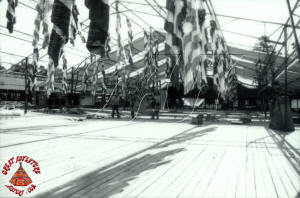 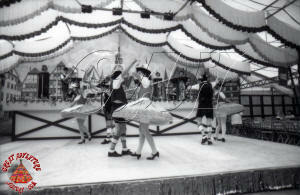 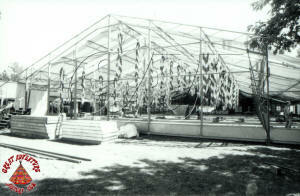 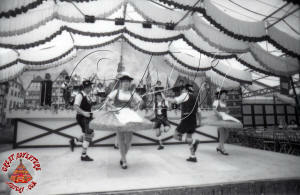 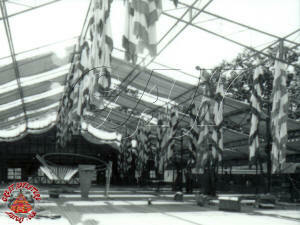 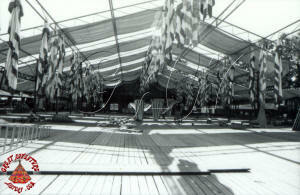 The building was designed to be setup as a temporary building as part of an Oktoberfest celebration. 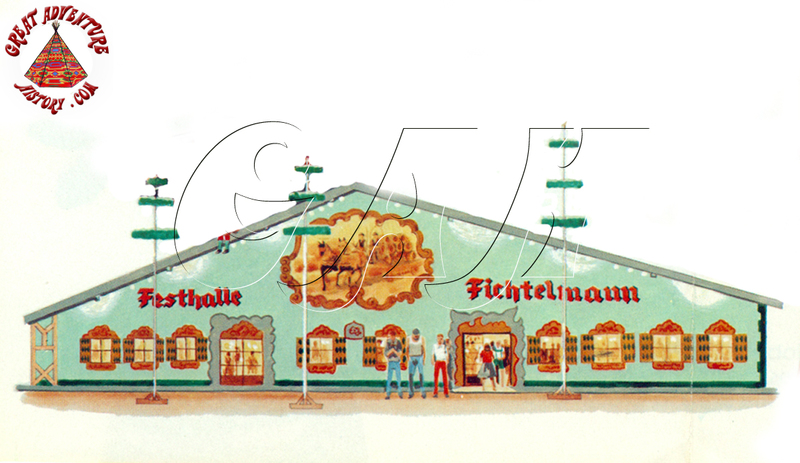 The Festhalle had a very traditional style and could hold up to 1500 guests. 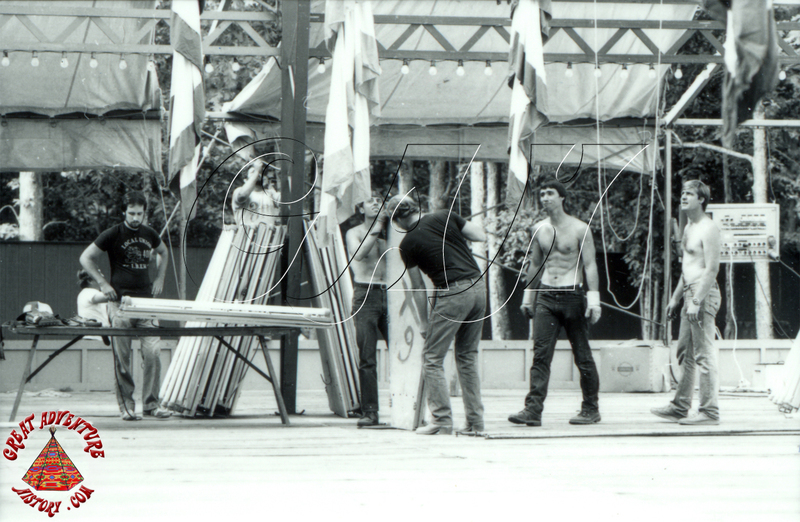 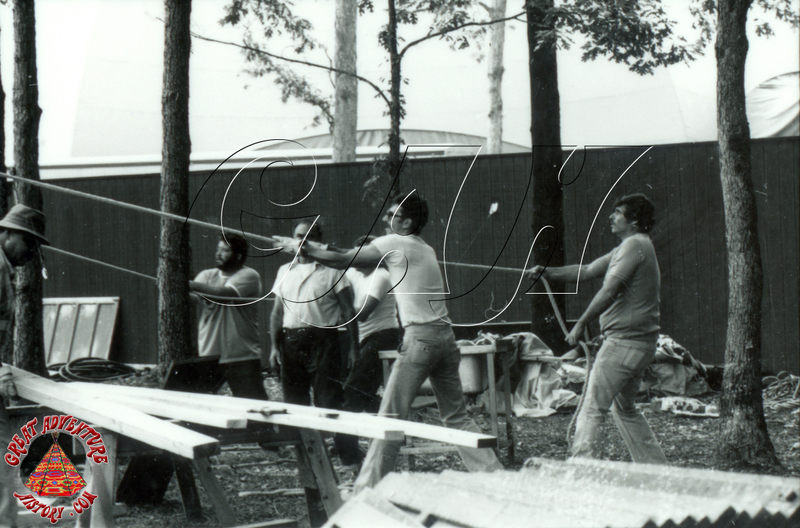 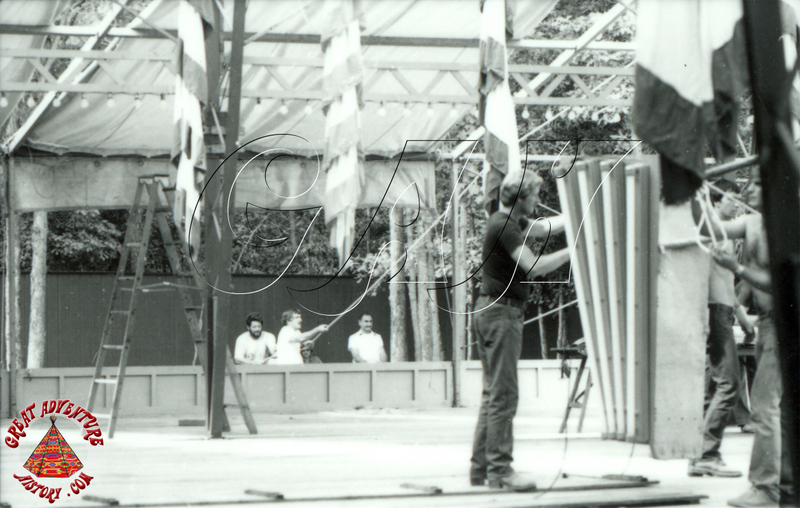 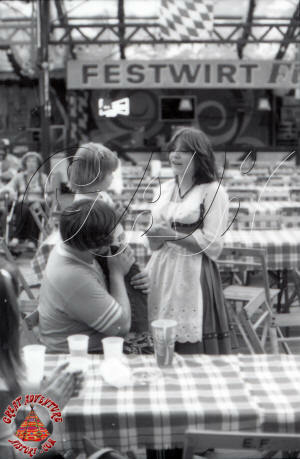 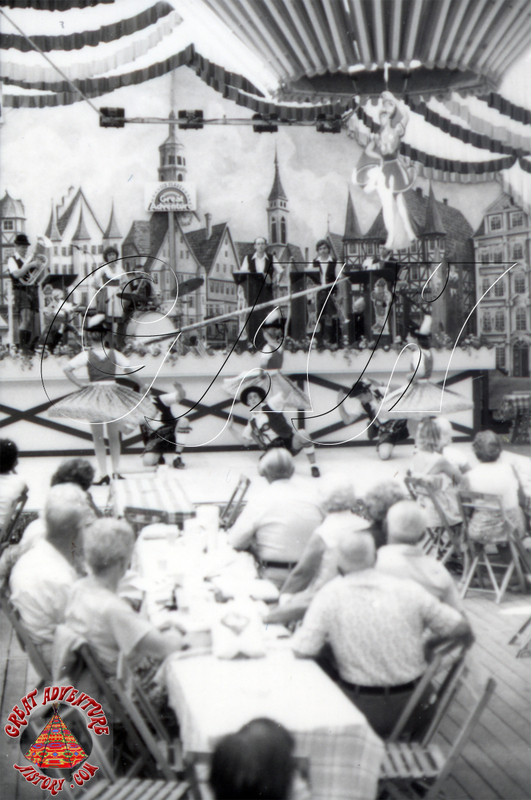 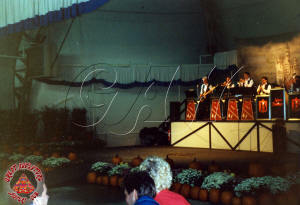 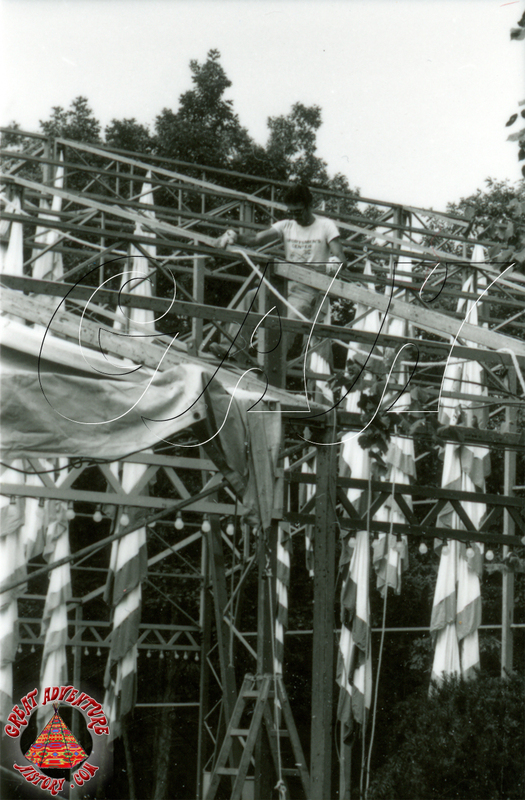 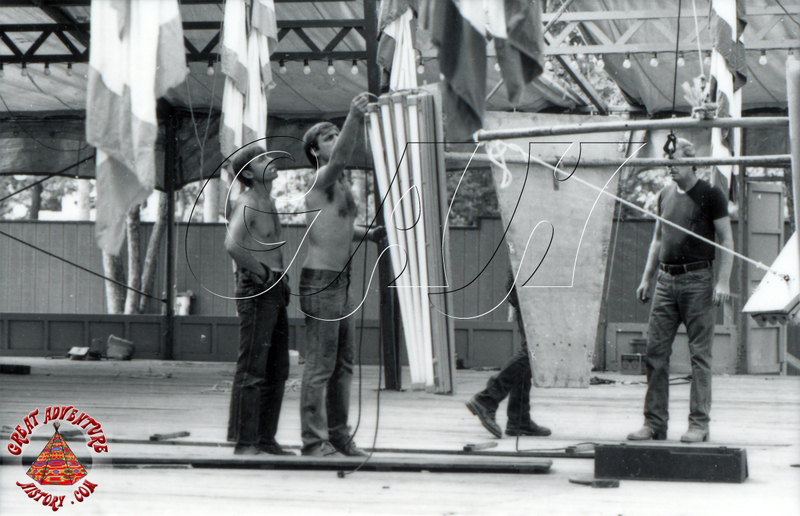 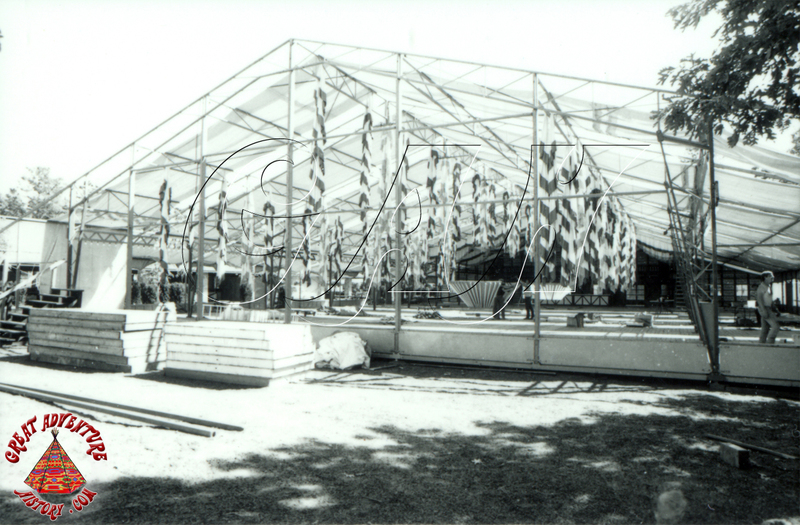 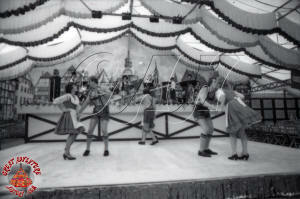 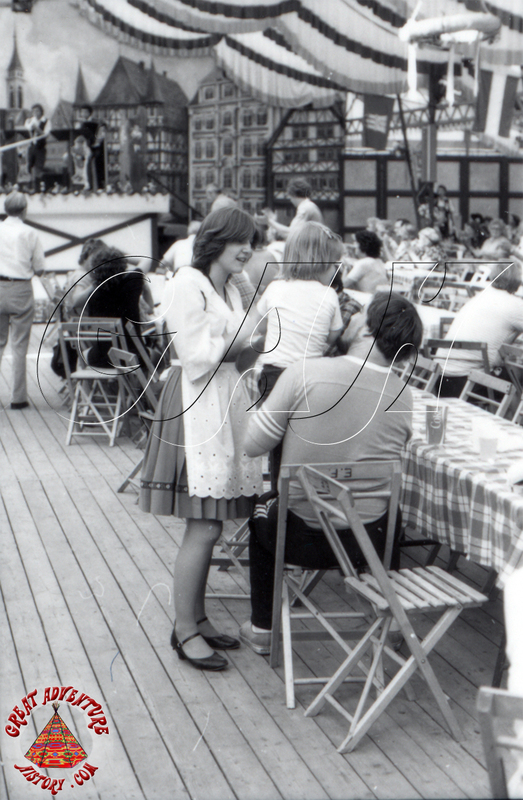 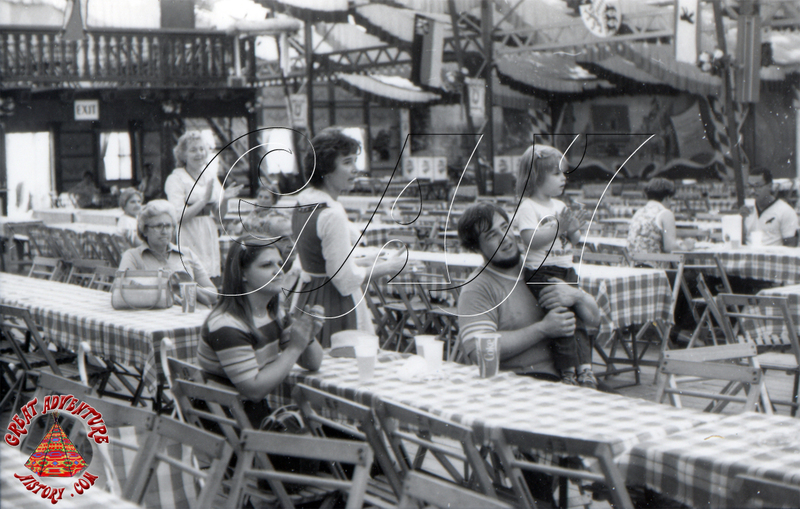 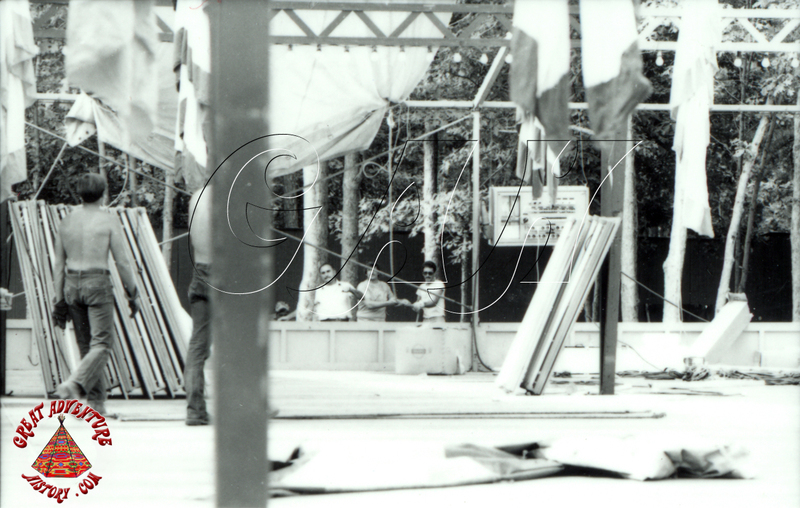 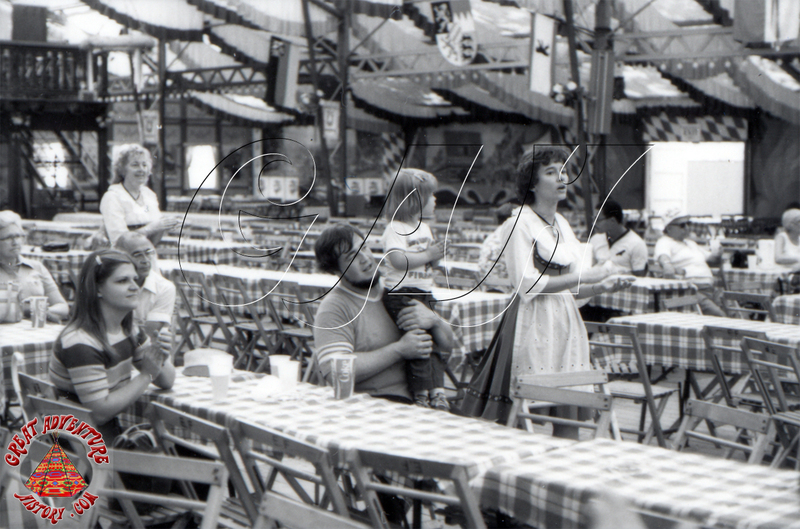 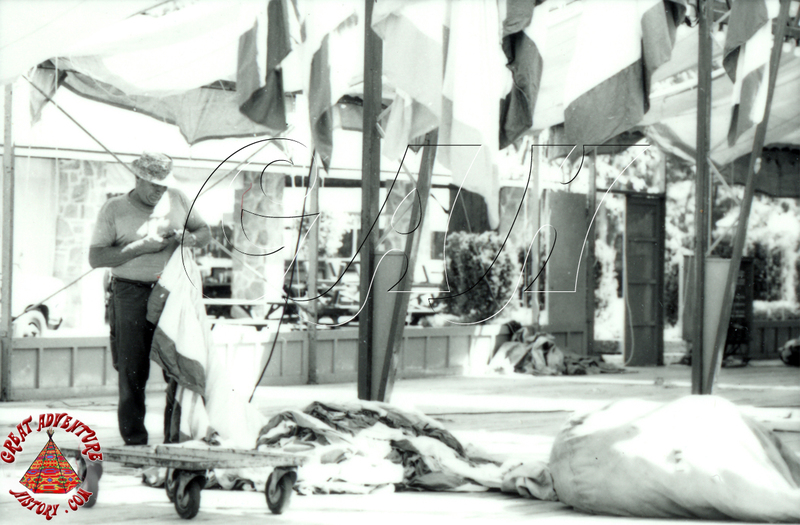 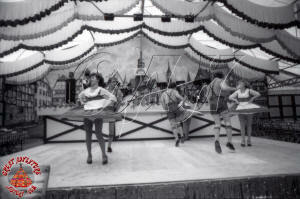 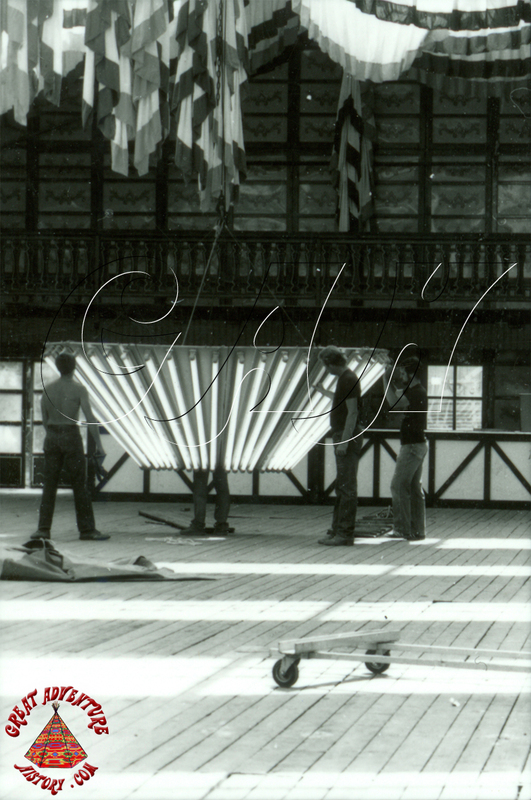 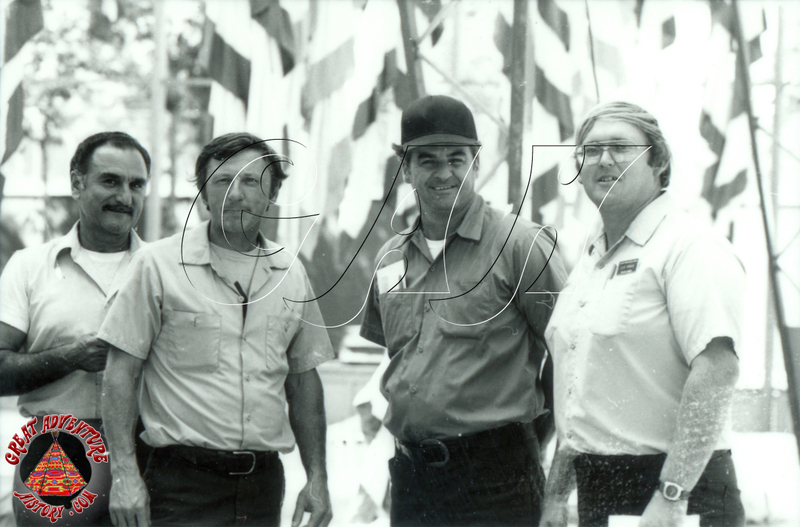 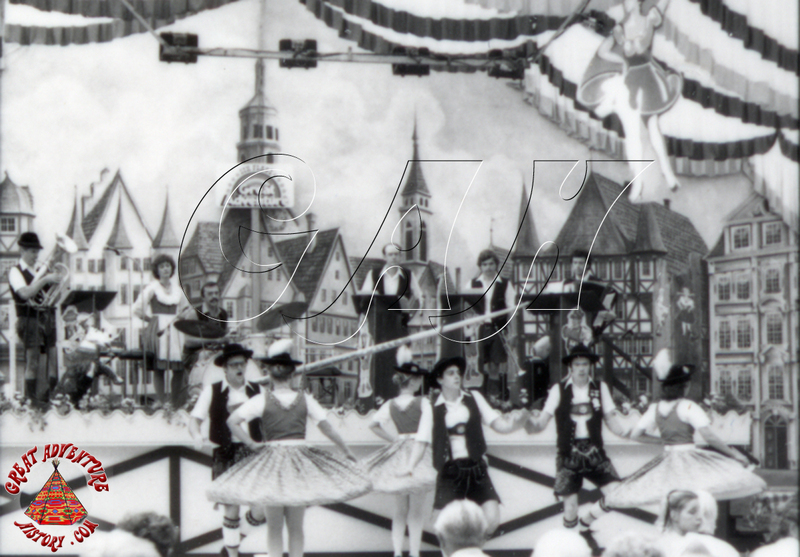 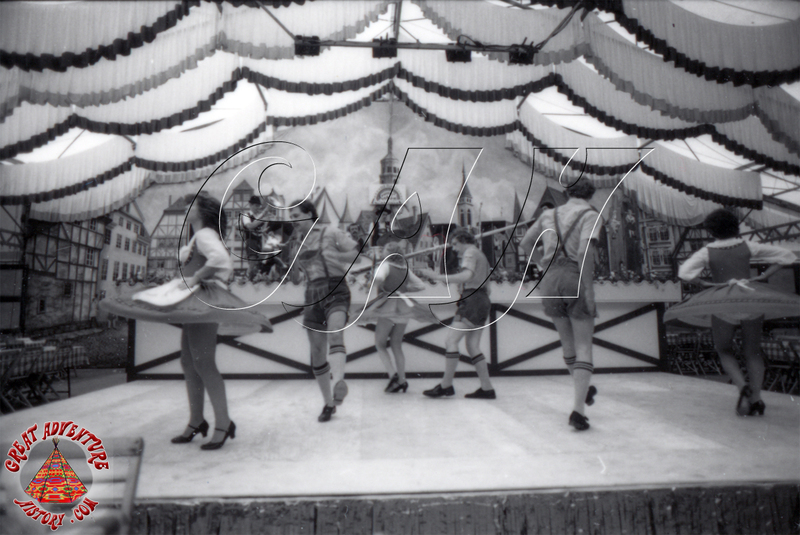 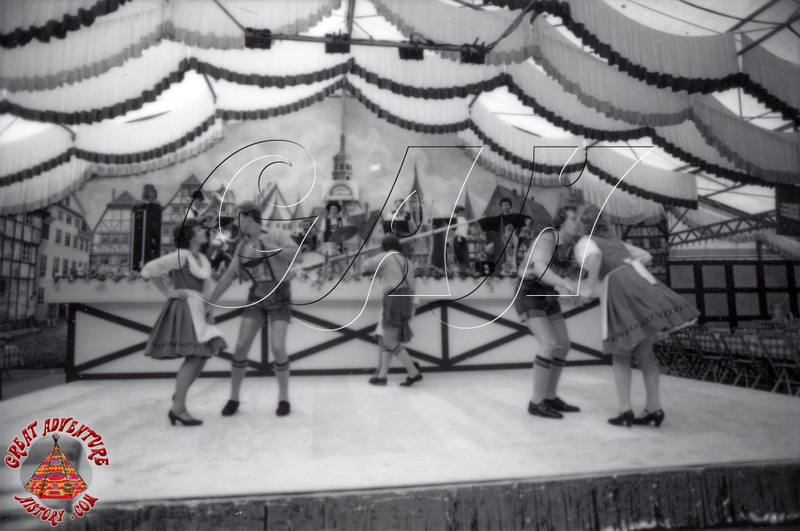 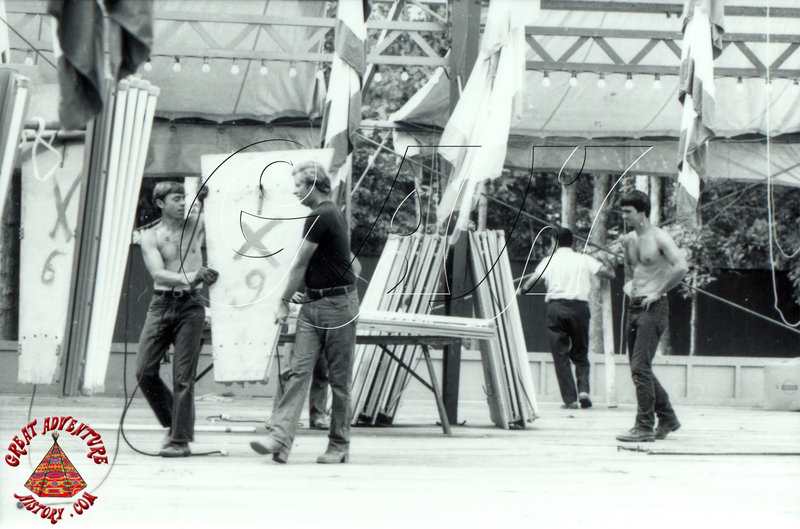 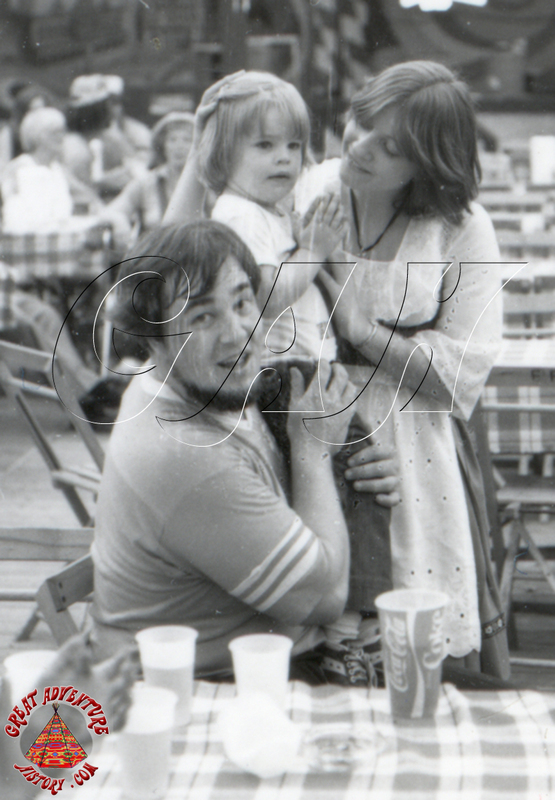 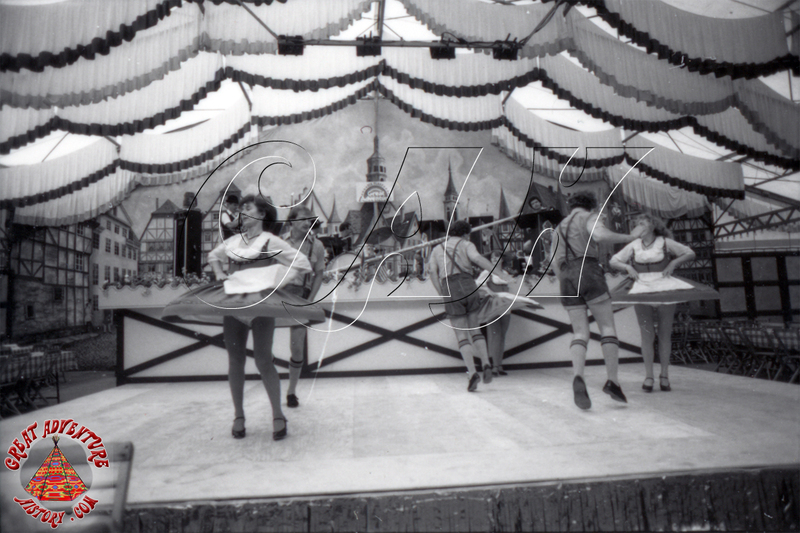 Park president Larry Cochran had visited the Munich Oktoberfest in 1979 and decided that bringing an authentic structure to Great Adventure was a "key ingredient" to creating a memorable event. 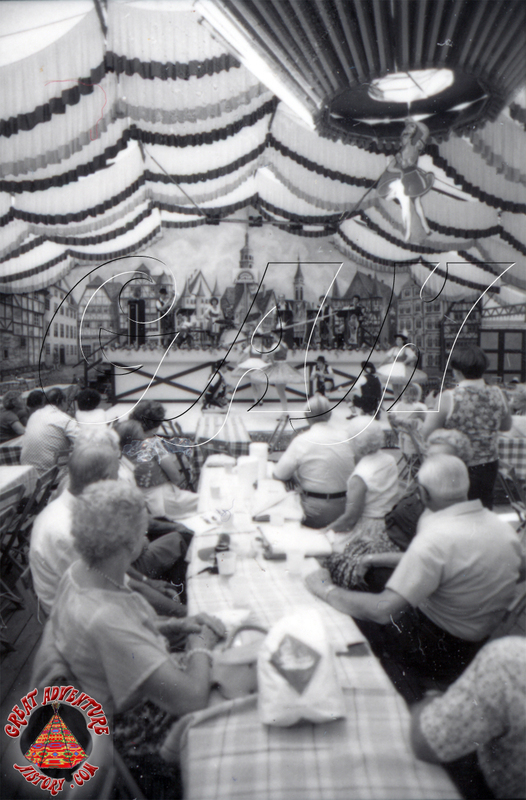 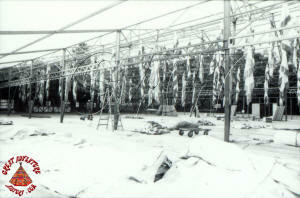 The Garden of Eatin' was remodeled in preparation for the arrival of the Festhalle and Oktoberfest. 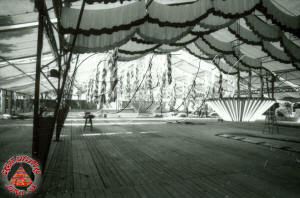 The Festhalle was built on what would later become the site of the Fest Haus. 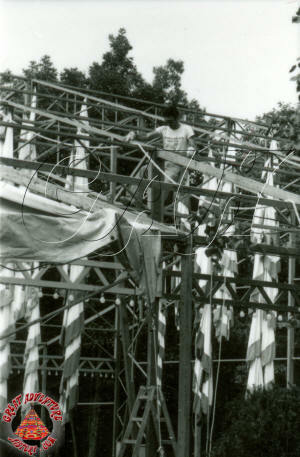 Construction began with setting up a huge wooden platform to serve at the building's floor. 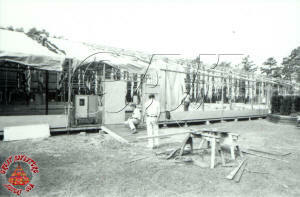 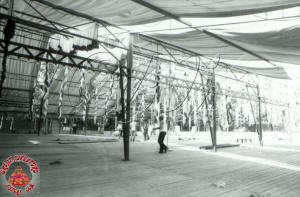 The steel framework was then assembled that would create the building's walls and roof. 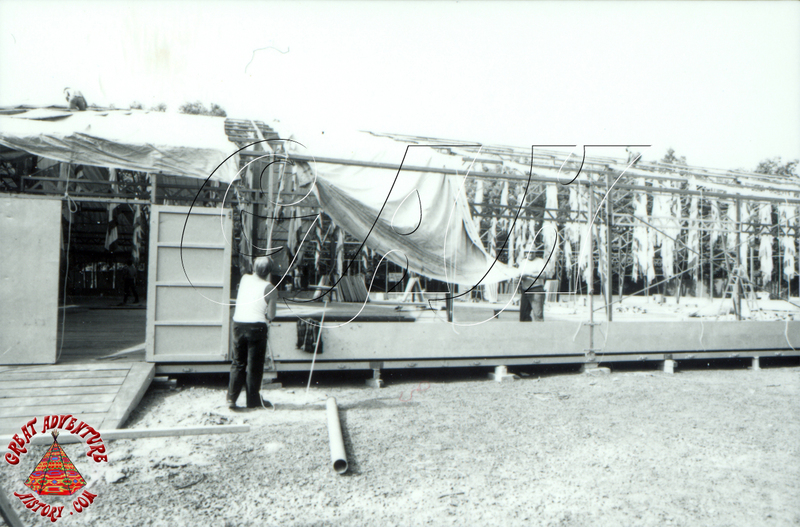 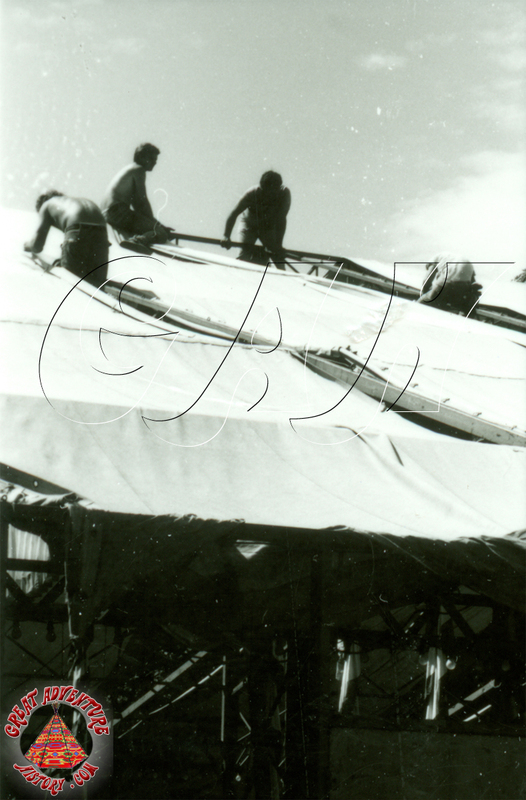 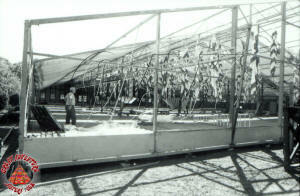 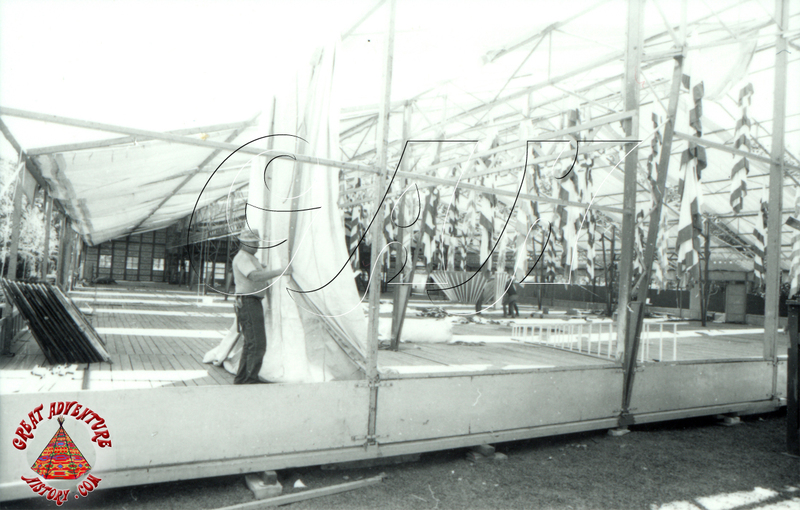 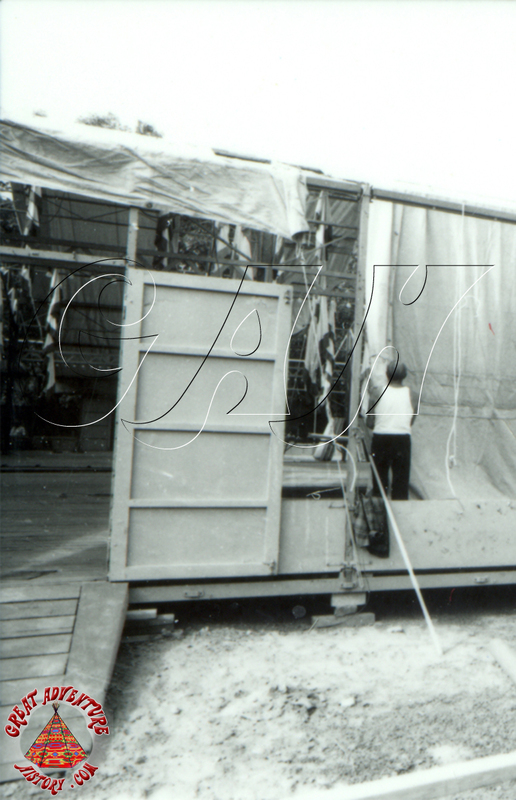 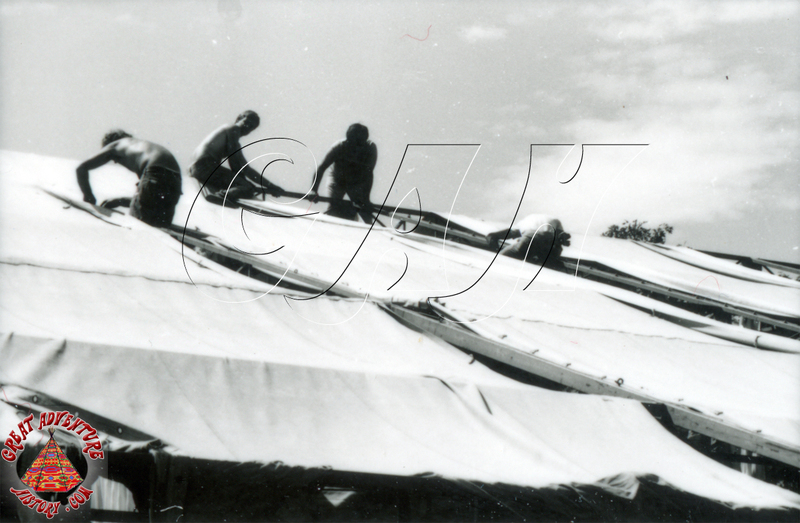 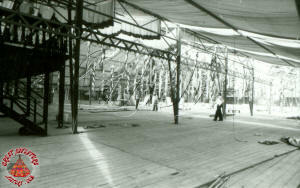 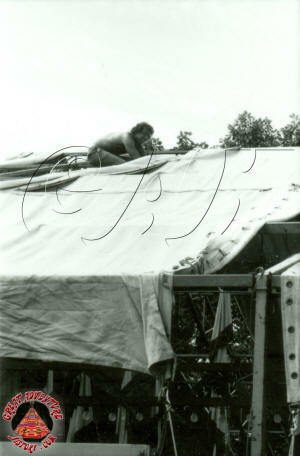 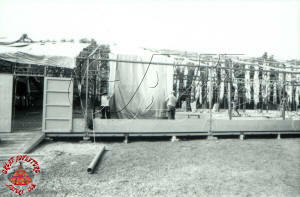 The canvas roof and walls were then stretched over the frame. 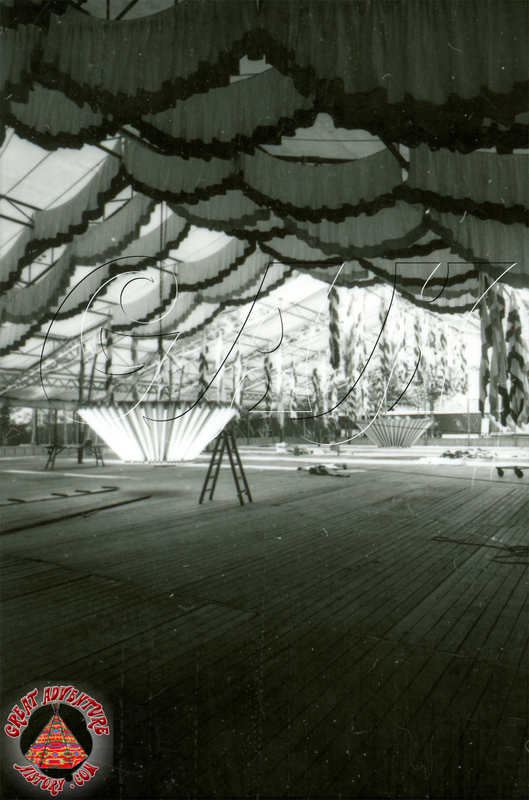 The Festhalle came complete with decorations and lighting. 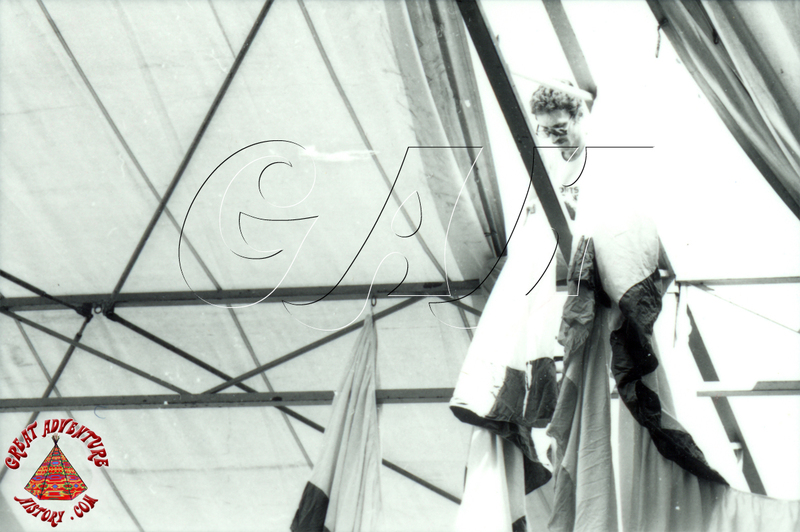 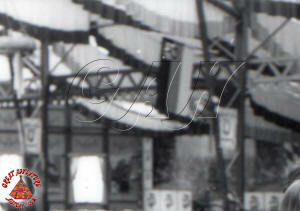 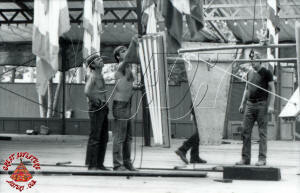 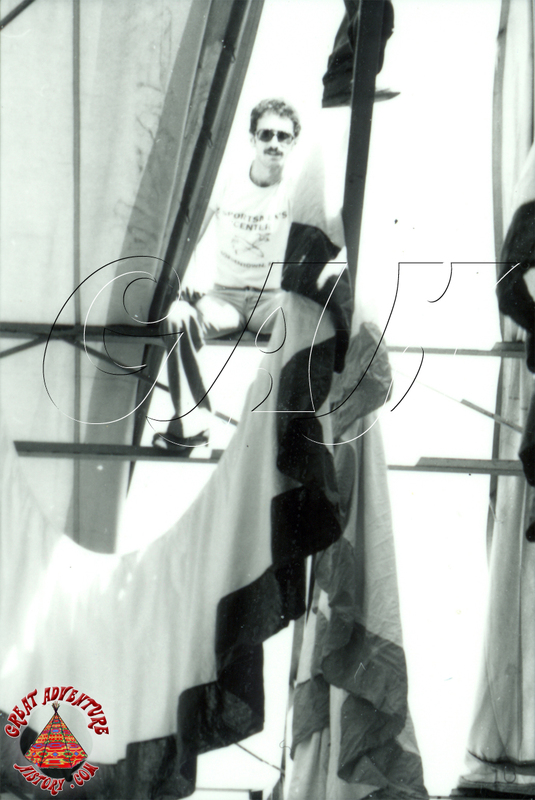 The colorful interior banners were hung from the rafters as they were put in place. Once the structure was up, the enormous chandeliers were assembled and raised up into the ceiling. 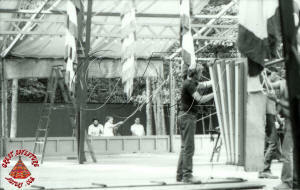 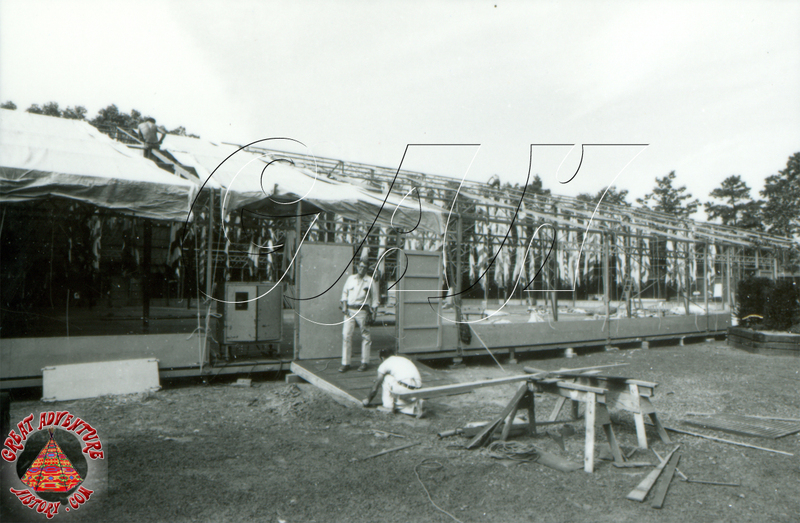 The enormous structure quickly took shape in preparation for the Oktoberfest crowds. 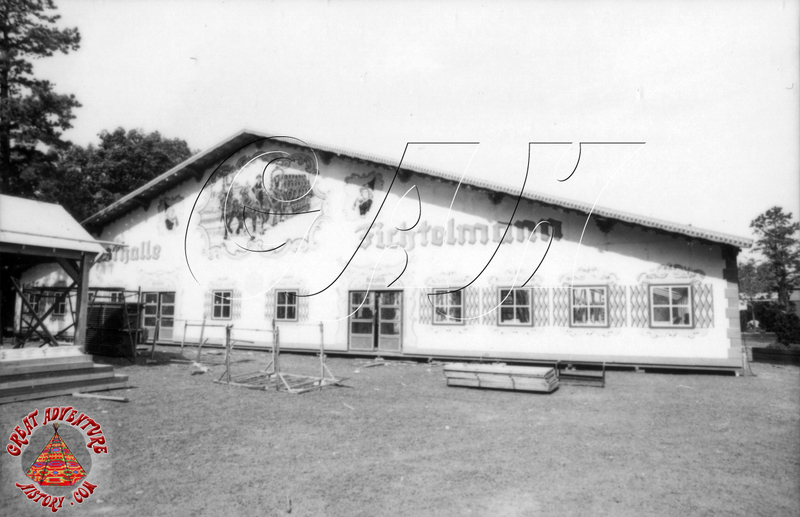 Other features of the building included decorative panels for the front facade which gave the Festhalle a chalet-like appearance including windows and doors. 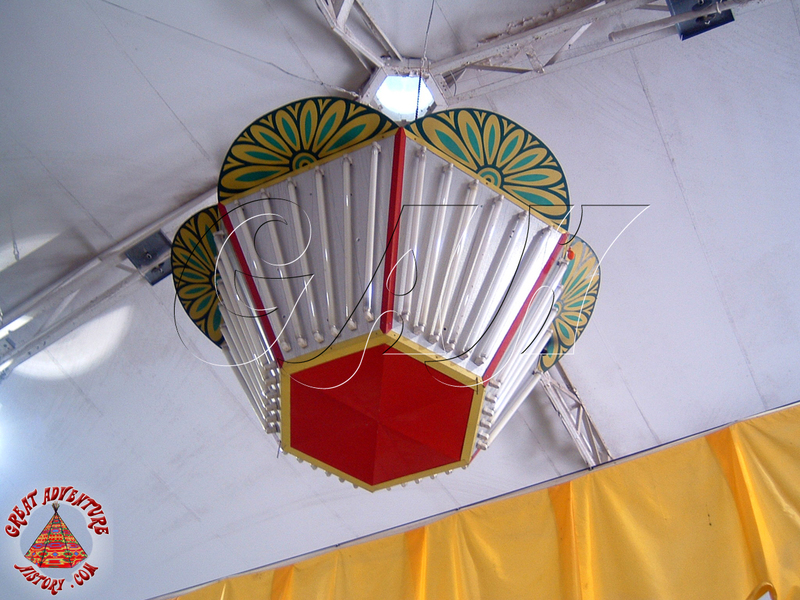 The interior side featured decorative scrolls and a faux-wood railing. 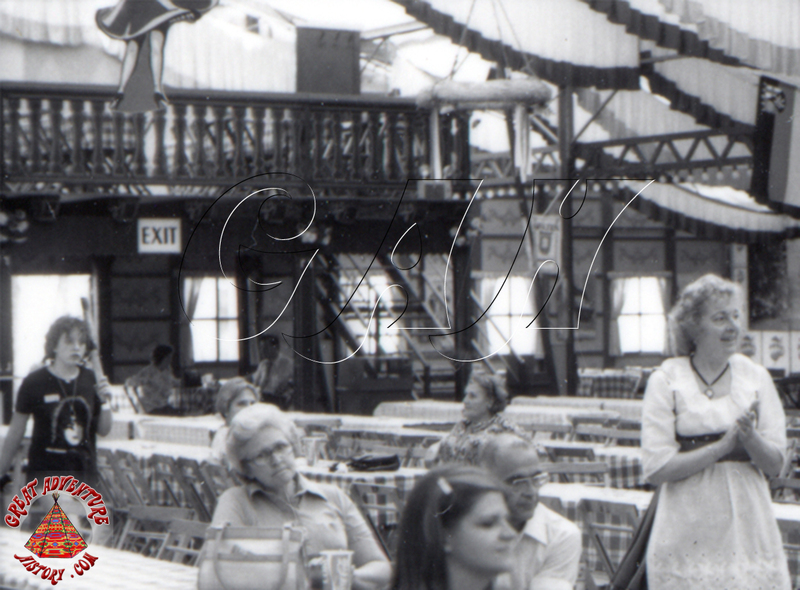 A bar was located at the front of the building between the entrance and exit doors. 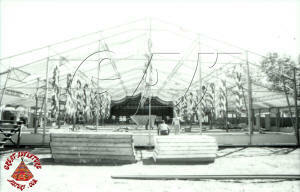 For a portable temporary structure, the Festhalle was really quite impressive in size and scope. 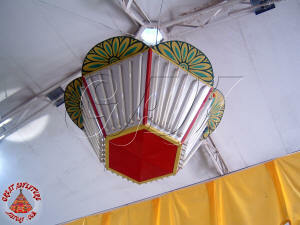 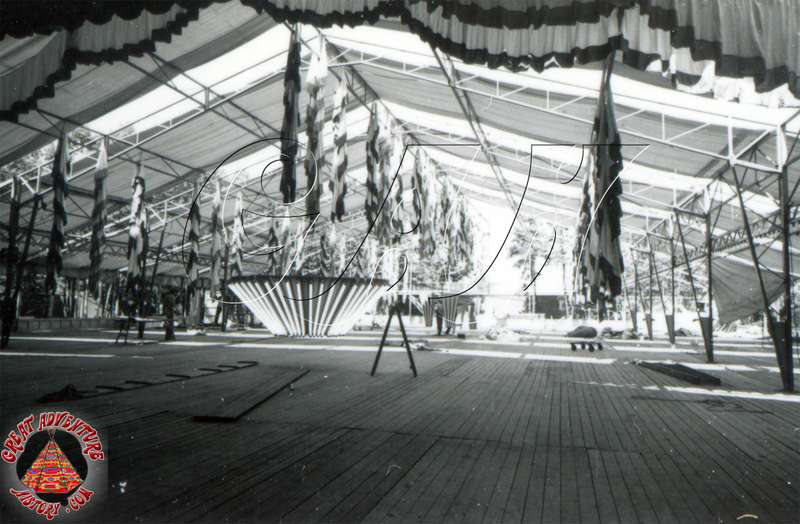 The colorful banners that festooned the building really set the stage for the festivities to take place. The interior of the Festhalle was setup with long rows of tables running the length of the hall, covered with brightly colored checkered tablecloths. The idea of Oktoberfest is to celebrate the harvest with food and drink. 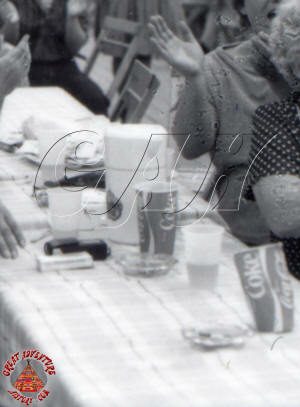 Soft drinks and beer were available along with authentic German food and pretzels. Beer was sold by the cup as well as by the pitcher. The pitchers even featured Great Adventure's Oktoberfest logo. 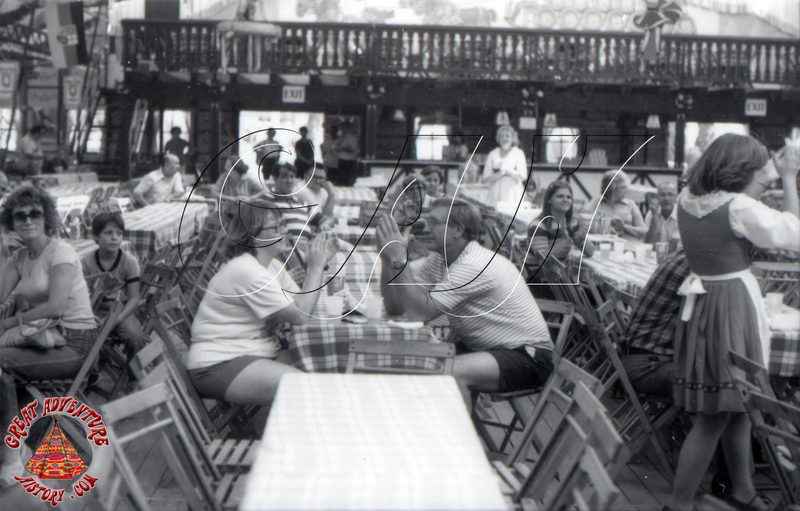 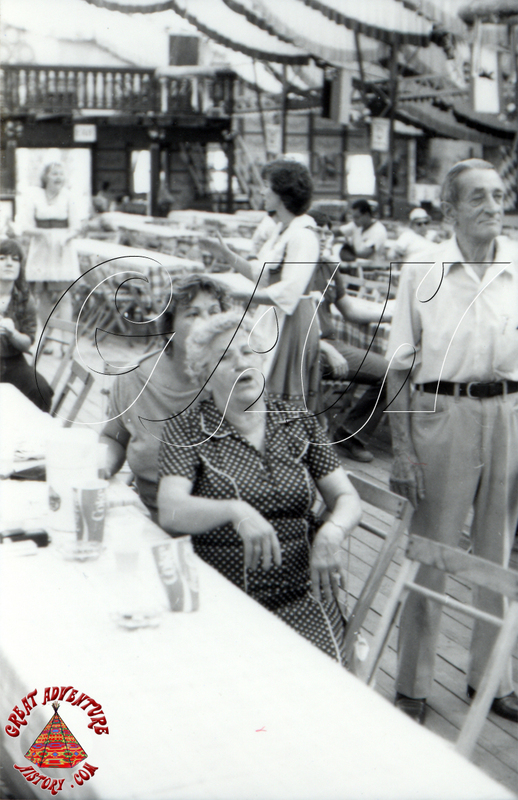 Smoking was still allowed inside bars and restaurants in 1980, and glass ashtrays dotted the rows of tables adding to the beer hall atmosphere. 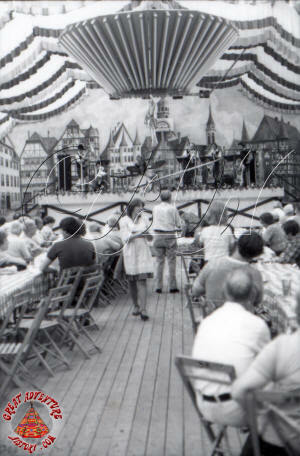 The far end of the Festhalle featured a stage for the bands and dancers to perform throughout the day. 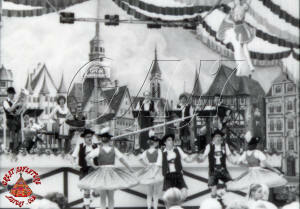 The back wall behind the stage featured a giant mural of a German village with half timbered buildings and church spires. A Great Adventure rainbow logo was included in the German backdrop to remind people where they were when viewing their photographs in years to come. 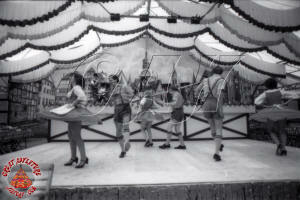 Throughout the day traditional oompah bands played complete with giant alp horns. 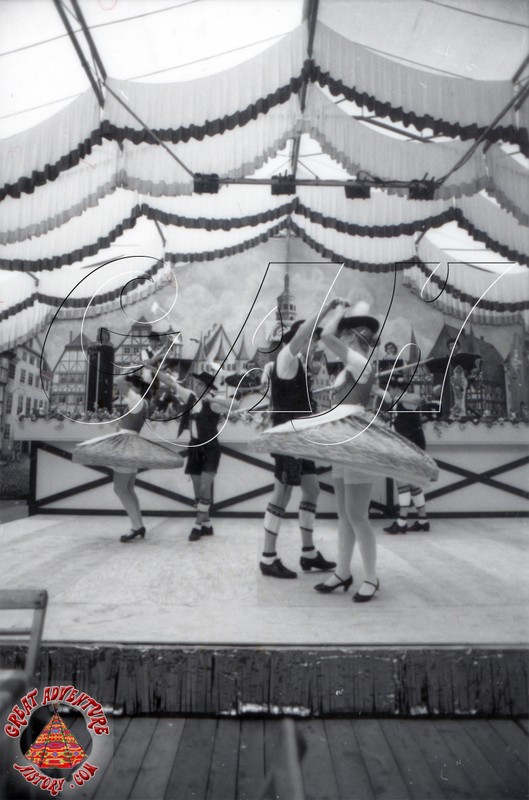 Costumed Shuplatter dancers performed the traditional dances, spinning in intricate patterns for the clapping crowds. 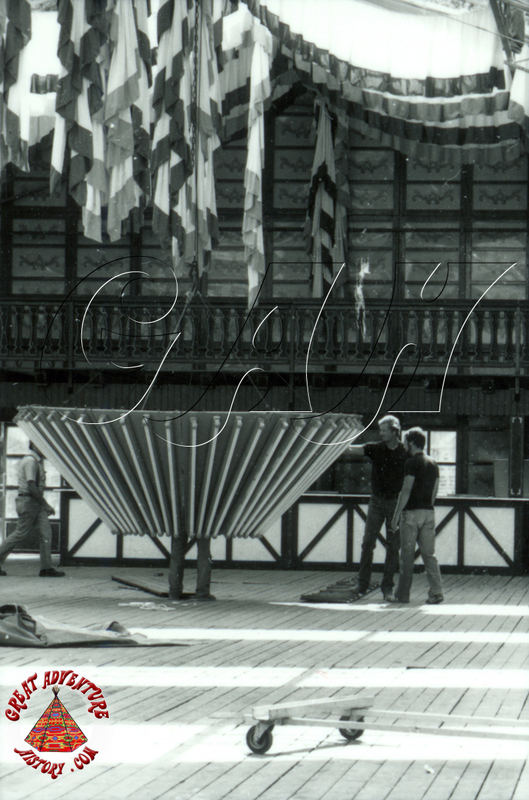 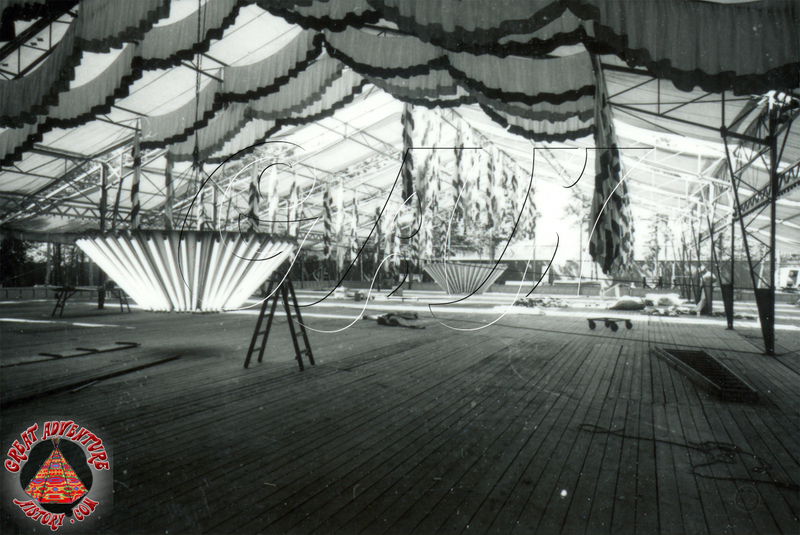 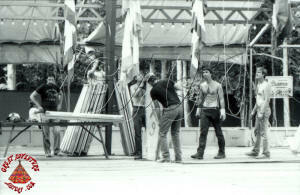 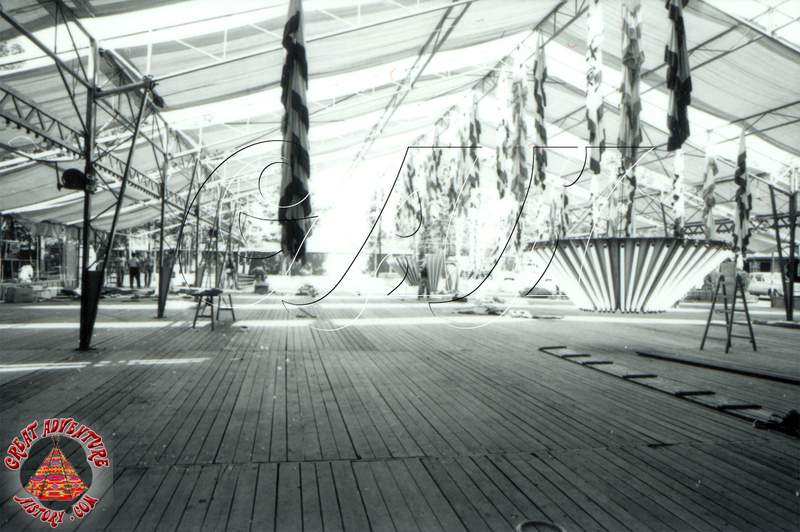 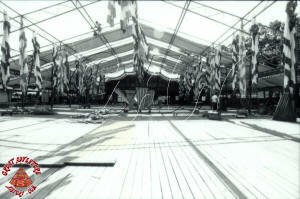 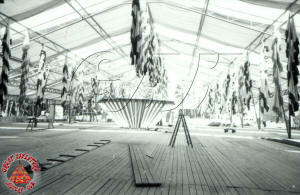 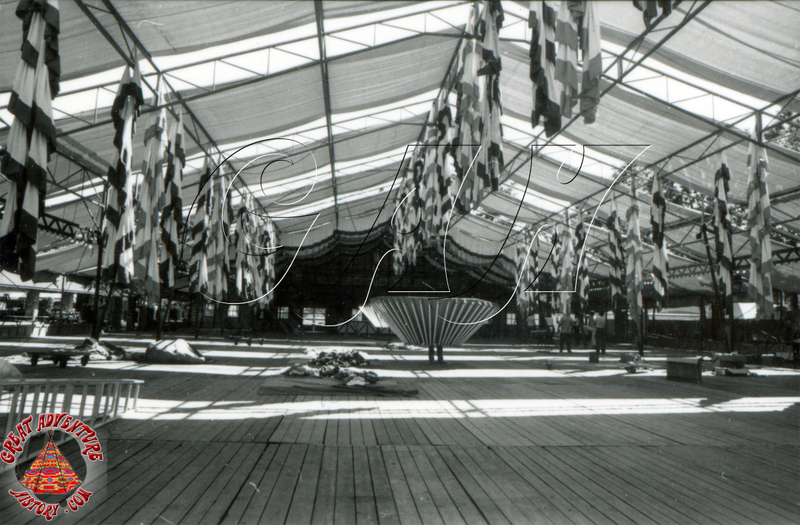 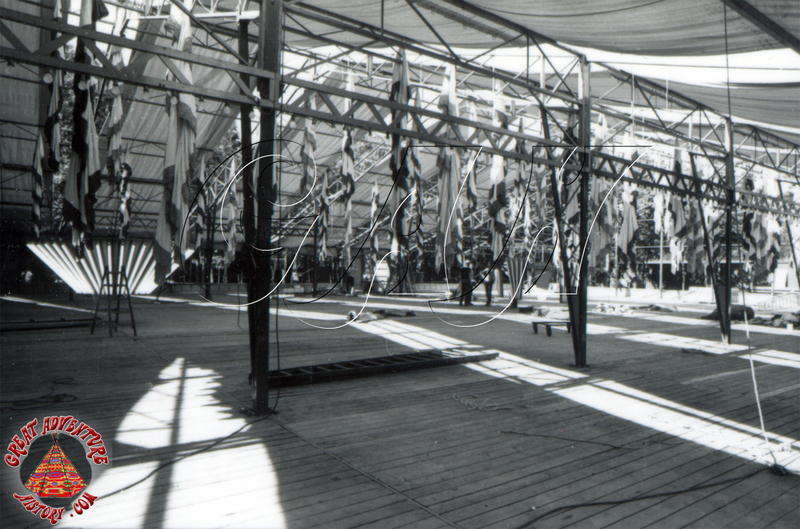 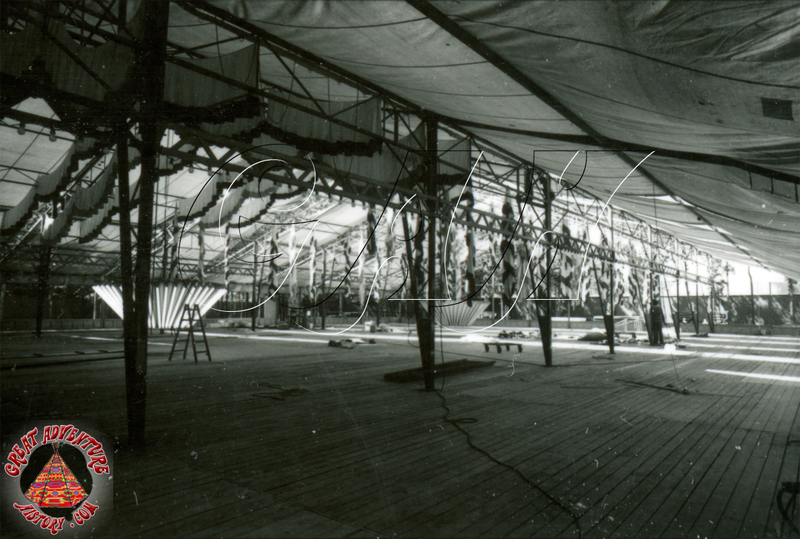 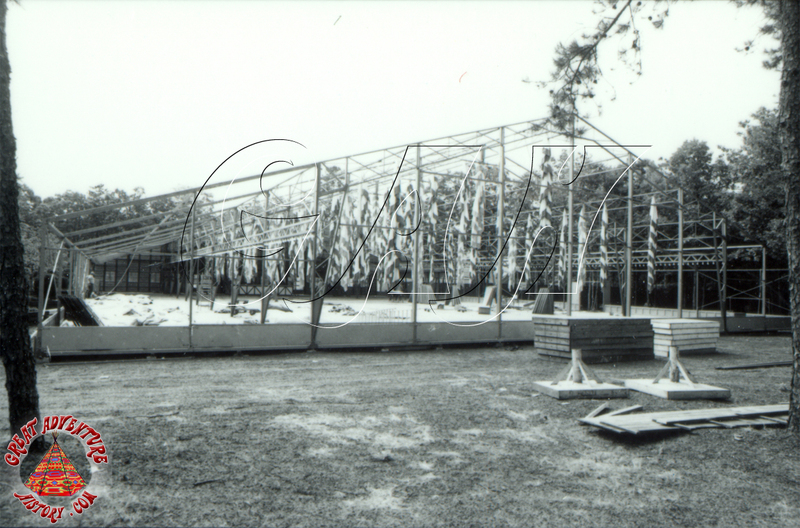 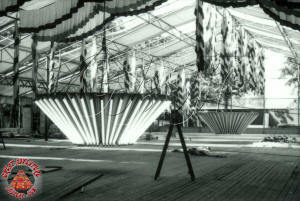 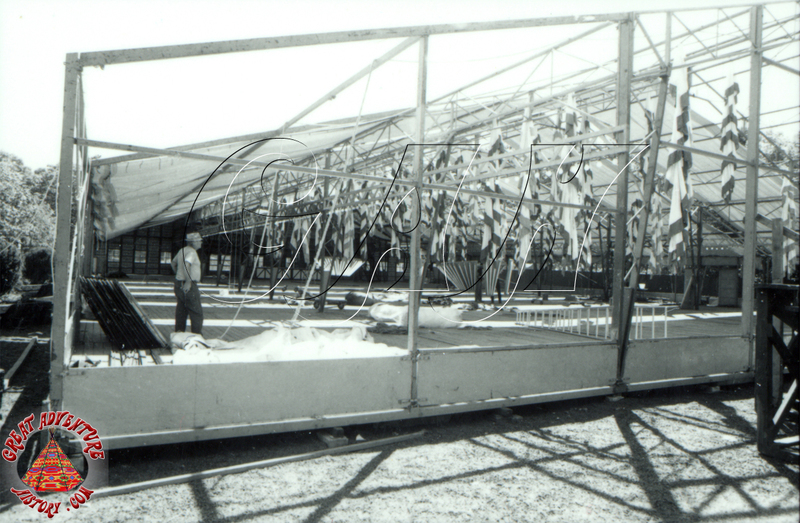 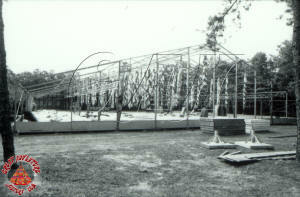 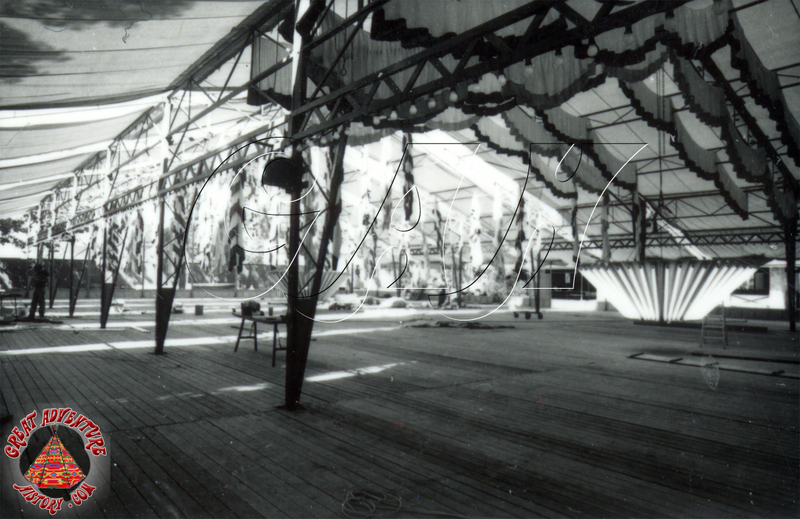 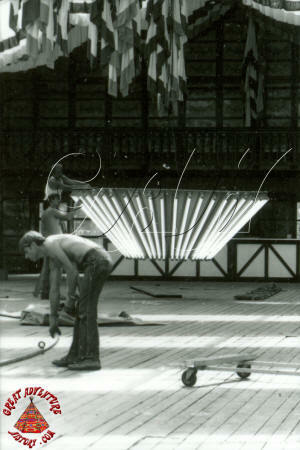 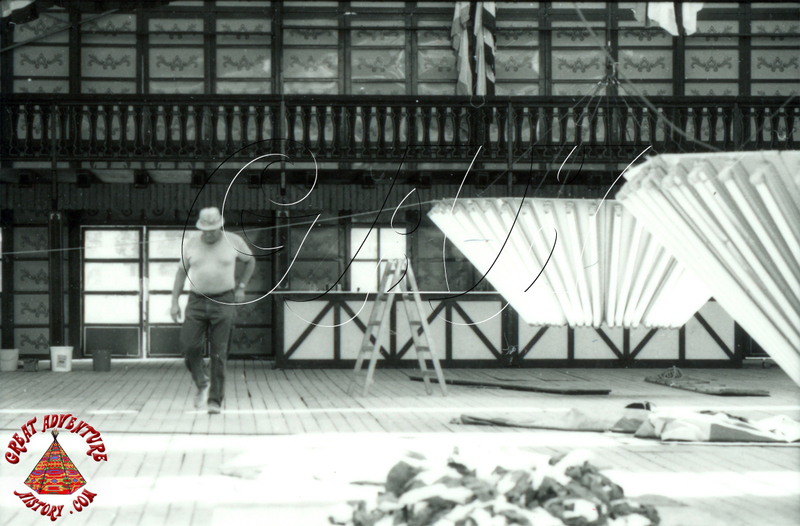 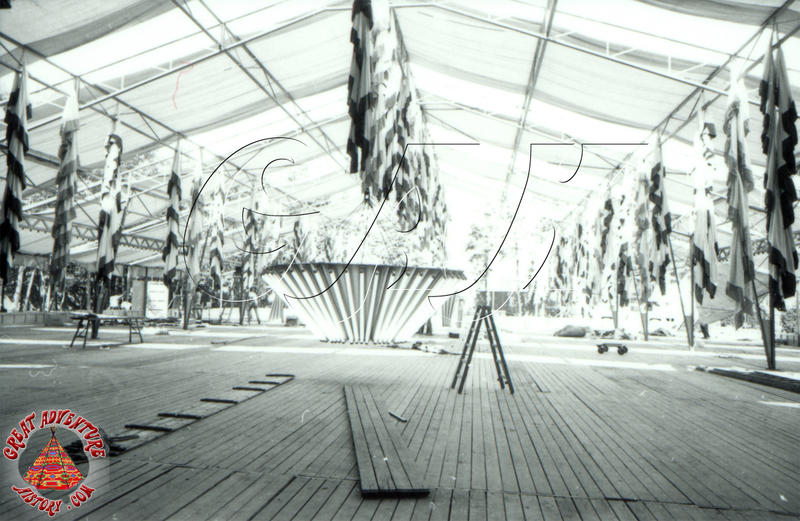 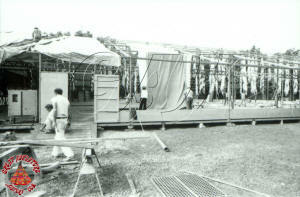 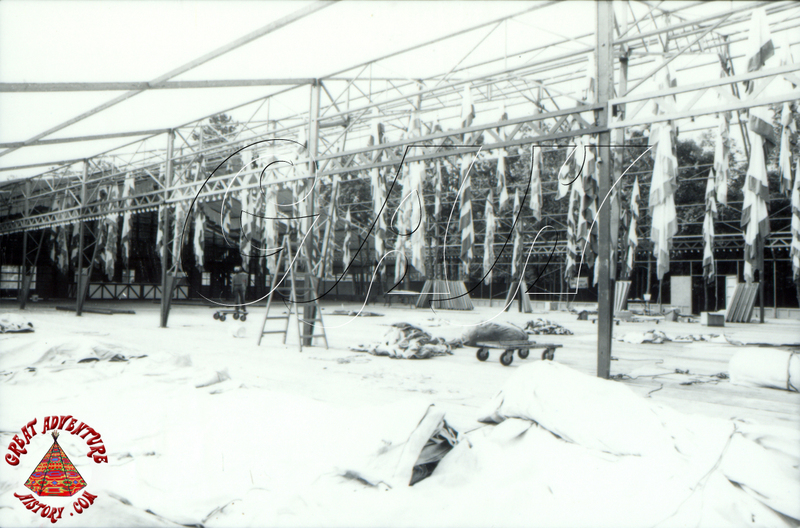 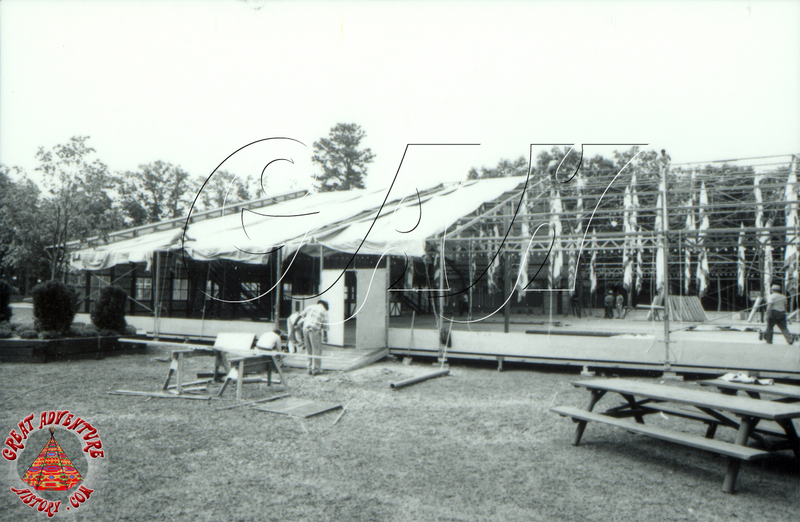 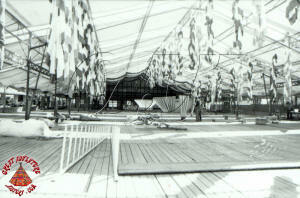 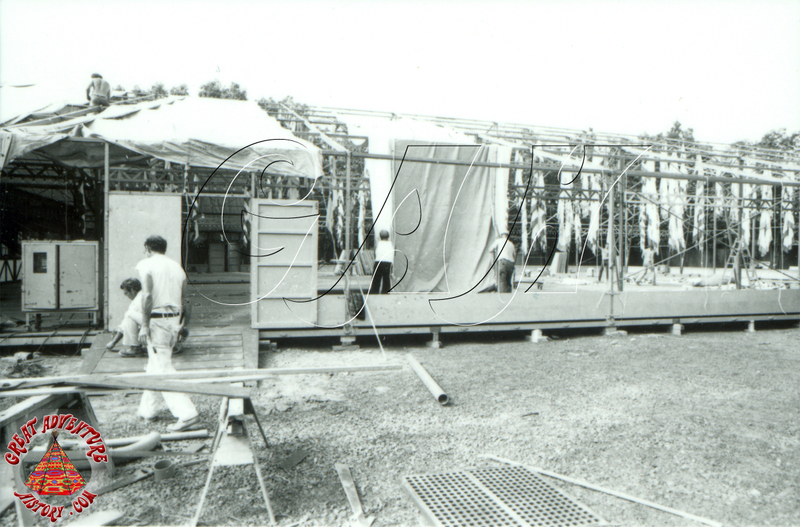 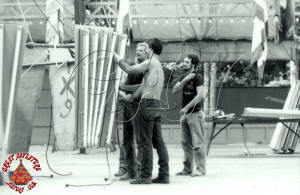 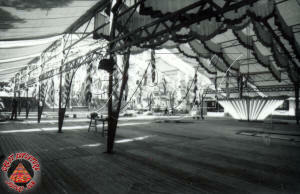 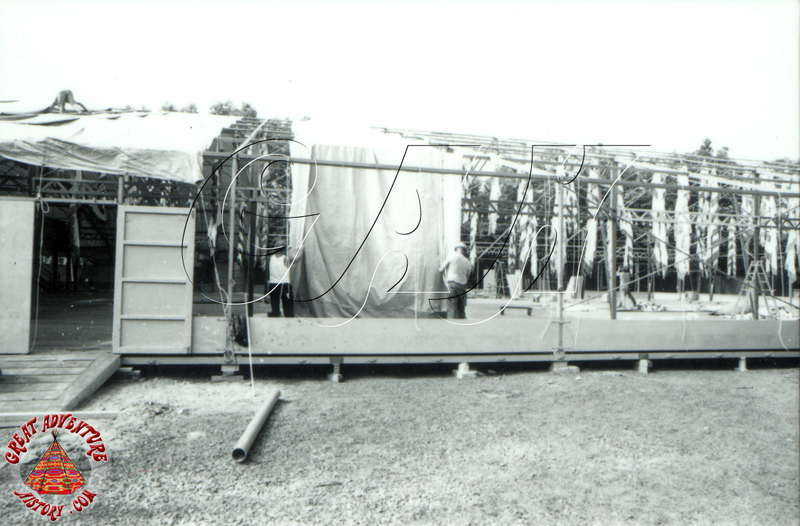 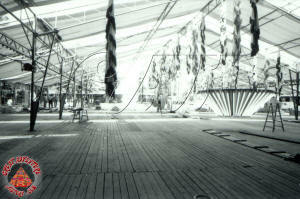 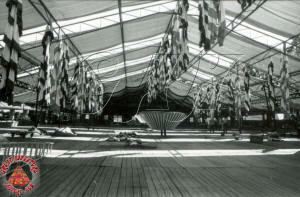 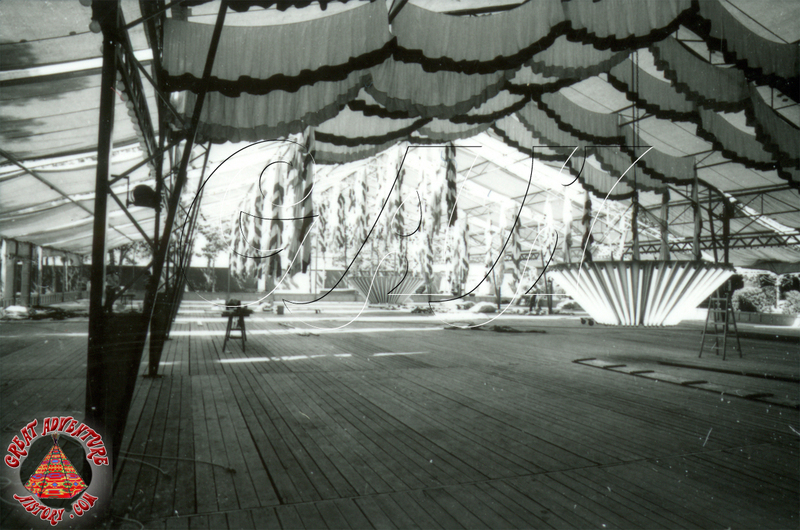 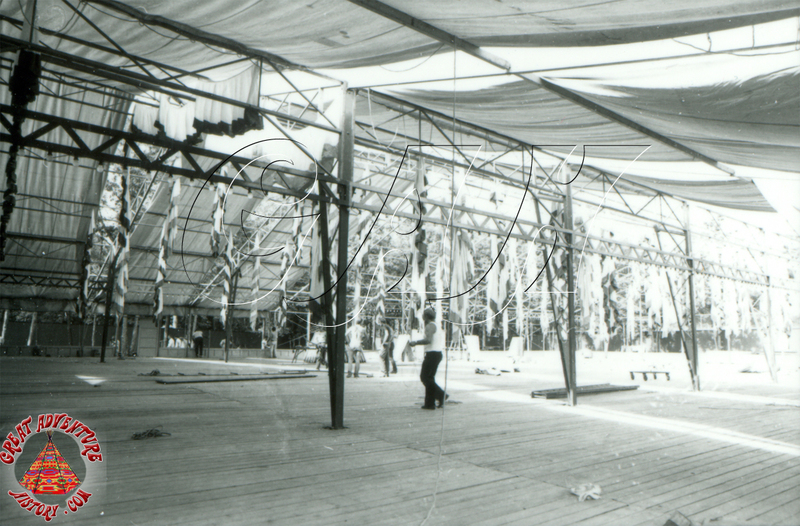 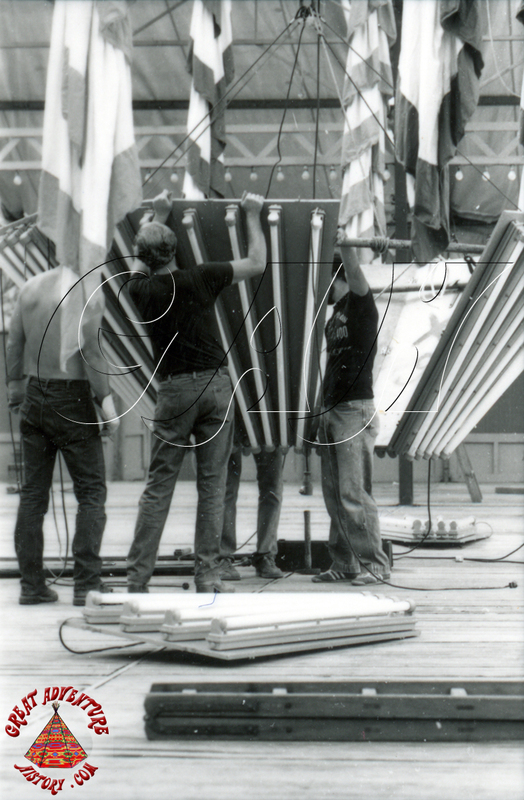 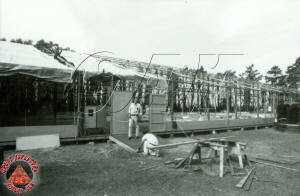 The Festhalle was disassembled and shipped back to Germany after the festival. The park retained the tables and chairs. 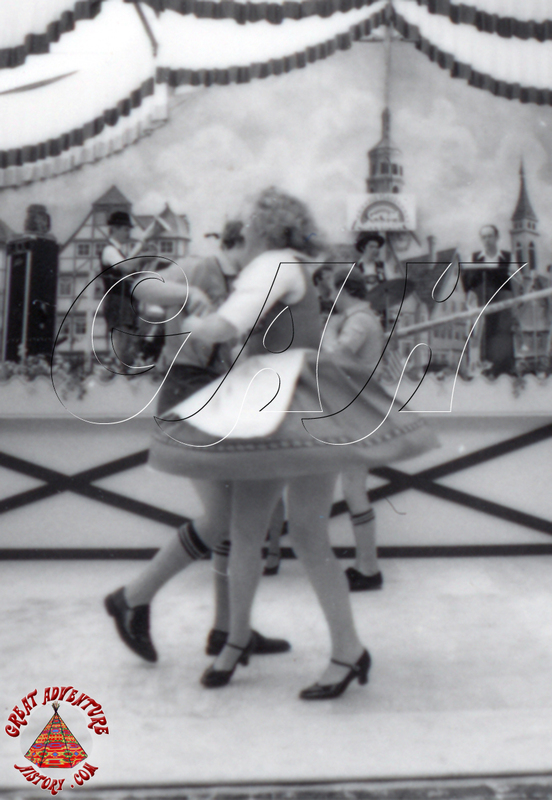 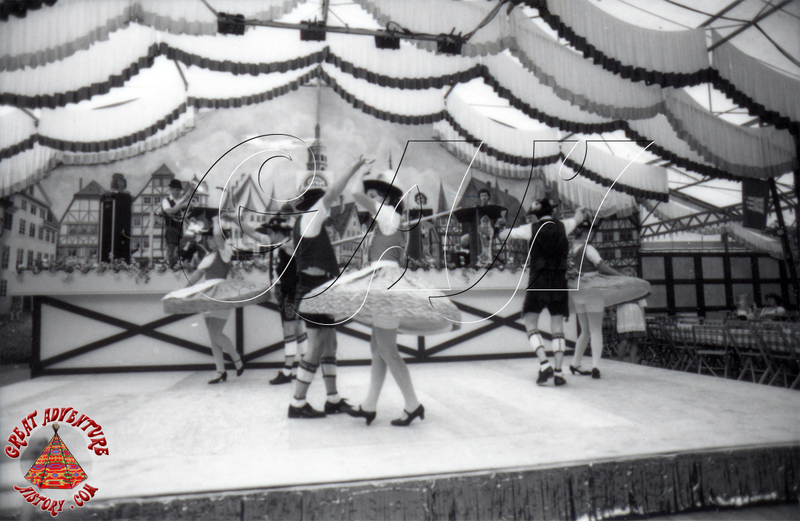 These would reappear each Oktoberfest at the park, all the way until 1992. 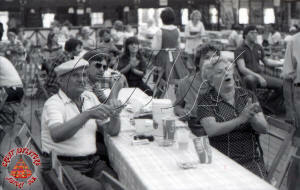 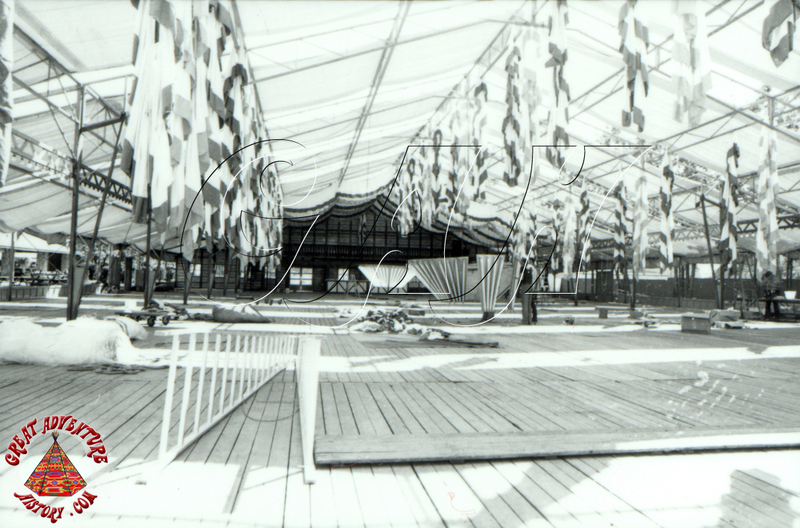 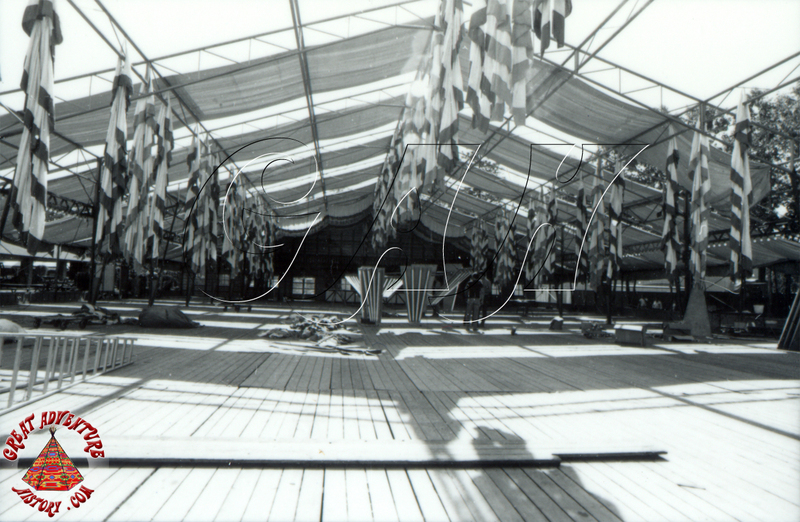 With the success of the 1980 Oktoberfest, a permanent Fest Haus was built to replace the temporary Festhalle. The new Fest Haus was even larger and featured many of the same authentic details found in the original Festhalle. 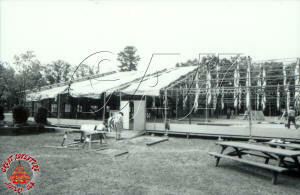 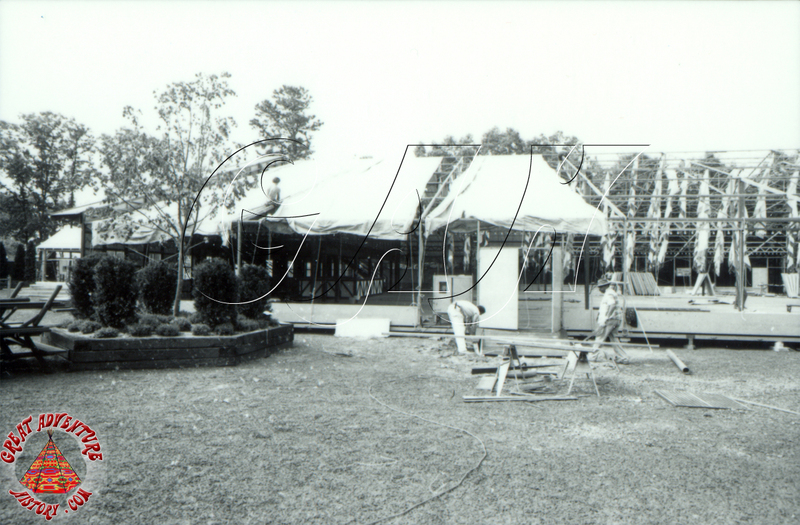 The Fest Haus still stands today as the Maple Pavilion in the Old Country Picnic Grove.